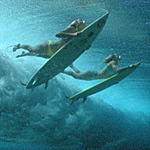 The surf movie is a genre invented by Bruce Brown. The Endless Summer (1966) and The Endless Summer II (1994) are cult classics the world over. In spite of their niche audiences, these documentaries are totally approachable. It is almost impossible to dislike the gorgeous scenery and Brown’s unpretentious narration. Bruce Brown has retired, and his son Dana has taken over the family trade. In the Brown family, the apple doesn’t fall far from the tree. Step Into Liquid looks uncannily like a Bruce Brown movie. All the elements are there: the homey narration, the exotic locales, the colorful and unexpected characters. Dana’s voice even sounds just like his father’s. Like Bruce’s films, Step Into Liquid spends about five minutes before shifting to a new topic or location. The Pipeline in Hawaii segues into the wipeout sequence, which jumps to the Irish surfers who bring Protestant and Catholic kids together in the wake of September 11. The Wisconsin surfers on Lake Michigan got a big laugh (one surfboard is decorated with a Land O’ Lakes butter logo), as did the crazy Texans who ride the waves generated by supertankers in the Houston shipping channel. And of course Dana saves the biggest waves of the year for the movie’s climax. A lot has changed in the decade since Bruce’s last film. Dana uses George Lucas’ new favorite format, 24p high-definition video, as well as film. (The digital projection at Denver’s Chez Artiste looks very good, with a few very minor exceptions.) There are also new board designs, new freestyle techniques, and new faces in the surfing world. And Dana just does some things a little differently. He interviews his subjects, for example, and presents them as talking heads. Bruce was more inclined to have his subjects act out silly skits for the camera. Nevertheless, if you’re in a fan of Bruce Brown’s surfing documentaries, Step Into Liquid is not a radical departure. If you’ve never seen one of these surfing movies, you might wonder why the world needs a new one. If they’re all so similar, why see this one? A new movie can also show the state of the art. Of the two “best” surfers in the world, only one has won any titles, and Dana hypothesizes it’s because Taj is ahead of his time. There’s also that new surfboard with a four-foot underwater extension that allows people to surf above the surface of the waves. You have to see it to believe it. And finally, people love to hear the same story over and over again. Why do you think they keep making new James Bond movies? Why do you think they made 30 “Blind Swordsman” movies in Japan? Why do children ask to hear the same bedtime story they already know by heart? Something in us tells us to seek out the familiar. Besides, watching another surfing movie makes more sense than watching another James Bond movie. It’s possible to make a bad Bond film. But take a movie camera to the beach, point it at surfers, all of whom are either good-looking, or a little crazy, or both, and you have something exhilarating.